I really should be studying. My brain is burned out on parsecs and spectroscopy. My mind is on a different cluster of stars: Baseball Stars--in particular, our beloved Phils. Doc. Doc... Are you there, Doc? Ladies and gentleman, I regret to inform you that Roy Halladay is human. Roy Halladay is, in fact, a human being. It's clear this condition is catching up to the once-Ace of Spades in that stacked-deck rotation of Four Aces. Remember that? It was only two years ago. Last night, Halladay failed to pitch through more than four innings. I'm going to try to avoid throwing statistics at you. When numbers fail, you give him the eye test. So far in 2013, Roy Halladay has failed both eye exams. He looks flustered, forced. He looks flat-out uncomfortable on the mound. The staff is getting knocked around, except for a few bright spots. The one-two combo is practically hitting themselves right in the kisser. Home Goods is having a White Sale this weekend. Think they'll have any nice towels? Ryan Howard. You mean the Big Peace Out? The guy is an enigma and there is just no explaining how he goes into these funks. But he does. He also comes out of them. Usually in a big way. Healthy, Howard will knock in 110 before you can say "Five. Five Dollar. Five Dollar Footlo--" ...and so on. #6 fails the eye test as well. Like he has years-past, Ryan Howard is swinging at bad pitches. Really bad pitches. And watching good ones go by. MLB scouts and pitchers are a wise bunch. They see a guy unable to connect on a breaking ball, they throw him breaking balls. He's so surprised to get a fastball down the middle, it's snapping Rawlings before he knows it. The kid, who ain't such a kid no more, will get straightened out. But .270 (damn numbers!) is a long way off. The table setters have been setting the table: Revere is getting on and has swiped a few bags; Jimmy is faring rather well in the two-hole. 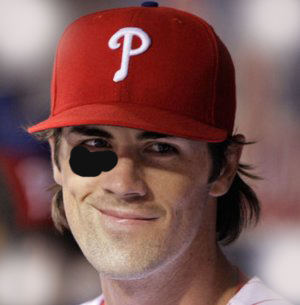 Utley? Well, Whitey, he is the man. Again, healthy. Bad knees are bad knees are bad knees. Same for the hips, but so far, so good... And these all bode well for the Phillies' season. They can compete. 2-5 ain't pretty. But rather than focusing on the numbers, let's see if they pass the eye test. While individual players pass, this team as a unit is about a C+. From what I understand, a pretty good tutor has been seen hanging out around third base. Maybe he can help pull those grades up. ...from a distance of the 700-Level to home plate, Ryan Howard appears lost in space.